As a young flutist, I went to my lesson each week prepared to play a sustained pitch for 90 seconds. This sustained pitch was something I had to do at the beginning of every lesson before I could move on to the music. If I failed, I was asked to try again and again until I reached the 90 seconds. I learned how the breath worked, and that knowledge and skill ultimately helped me play more difficult passages in the music, control phrases requiring delicate dynamic control, and produce a warmer, more resonant tone. The influence and strength of this heightened awareness eventually informed my artistic work as a woodwind performer and conductor, and more recently as a higher education administrator. Visual artists in other disciplines don’t use their breath in the same way, but the breath is still an important part of their artistic process. It makes sense in some ways because breathing is fundamental to life. And, when done in certain ways, it gives us the effective mental state for high levels of creativity and heightened awareness. Images, words, and ideas are greatly enriched with proper breathing. Understanding the power of the breath can help dancers experience a full dynamic and expressive range. It helps them to move past the level of simple technical proficiency to the level of true artistry. Actors enjoy the same experience as they become great artists. All human movement begins with a breath whether we aware of it or not. It informs everything we do. 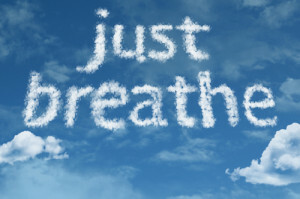 Many of us take breathing for granted, but we can all learn to be more creative in everyday life and work by using our breath and breathing more consciously—thinking, speaking, and moving with heightened awareness and higher levels of creativity. Great art comes about through increased awareness, vision, deep understandings, and wonder. Breath is what connects you to these elements. In fact, the Latin root of the words respiration and inspiration—spirare—means “to breathe.” If you feel uninspired, then no breath has been put into what you’re doing. That leaves you feeling unenthusiastic and indifferent. Think about how the words breathe and breath are used. What do these statements mean? The director breathed new life into the play. Working with that conductor was a breath of fresh air. The actor breathed confidence into the role. Remember to pause and take a breath. That experience left her breathless. Her attitude breathed new life into the institution. Artists breathe life into stone. As your own creativity self-coach, you owe it to yourself to learn to breathe deeply and become more aware of your breathing. Breathing can be trained. It is a physical process that you can consciously control. But we tend to forget it’s even there. Take some classes, read about various techniques. Take control of your life as a work of art. You will be more productive, have more energy and enthusiasm, and enhance the creative process of your life and work. Outstanding! Thank you Pat for the reminder. I will continue to use this lesson as a counselor, a martial artist, a teacher, and as an evolving being. I appreciate you! Thank you Steve! I appreciate you too! This practice certainly gives us strength, energy, and inspiration. I feel so fortunate to have learned this as a part of my artistic work and to have then been able to connect it to my life.